More than 300 fine people freely give of their time and talents to DeMar every year. That’s almost a volunteer for every runner! They give DeMar’s races that unmistakable touch—and make our runners feel cared for. You don’t have to run a race to be a critical part of one. Fill out the volunteer form below and someone will be in touch with you soon. Do you have any special skills that would be of particular use for the marathon? The Community Kitchen started volunteering at the DeMar Marathon in 2012 and we were happy to help with this amazing community-wide event. 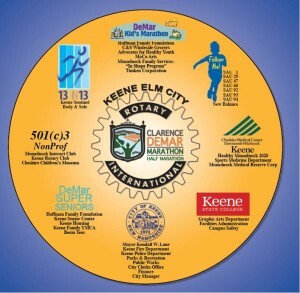 The Keene Elm City Rotary is a “hands on” club of approximately 60 members. 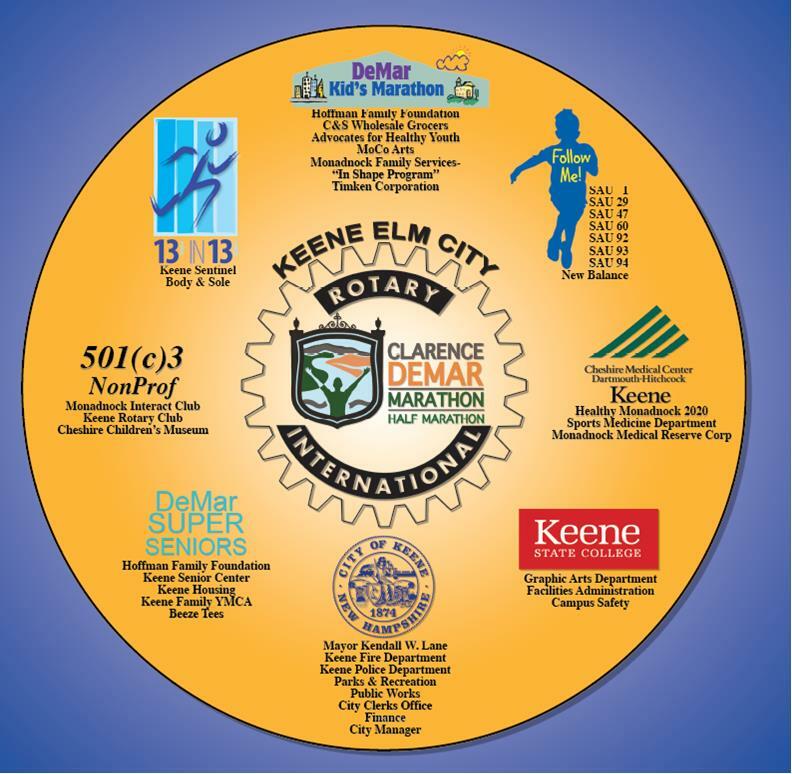 Chartered January 15, 1990 as part of District 7870, The Elm City Rotary is a spin off of the long established Keene Rotary Club. Founded with the intent to do things a little differently than our father club, our broad goals are the same, Service Above Self. Being a “Hands on Club” is both an important part of our roots and an important part of who we are today. Projects have included International service work in El Salvador, delivering food baskets for the Keene Community Kitchen, dictionary’s for every 3rd grader in our region, roadside clean-up, numerous painting and building projects for local non-profits and many others. We are well known for our Children’s Classic Golf Tournament which was held annually for 14 years and allowed us to donate over $142,000 to 16 different children’s programs in Cheshire County. Having now taken on the Clarence Demar Marathon, which is in it’s 32 year, we will be able to continue our primary focus on the needs of underprivileged youth in our community as well as many other humanitarian grants and hand’s on projects. We look forward to making the Demar Marathon a fun and unique experience for runners, volunteers and the community for many years to come. Known throughout district 7870 for our positive, uplifting (and early) meetings, the Keene Elm City Rotary meets Thursdays at Stone Arch Village on Court Street in Keene. Breakfast is Served at 7:15 and our meeting begins at 7:30.